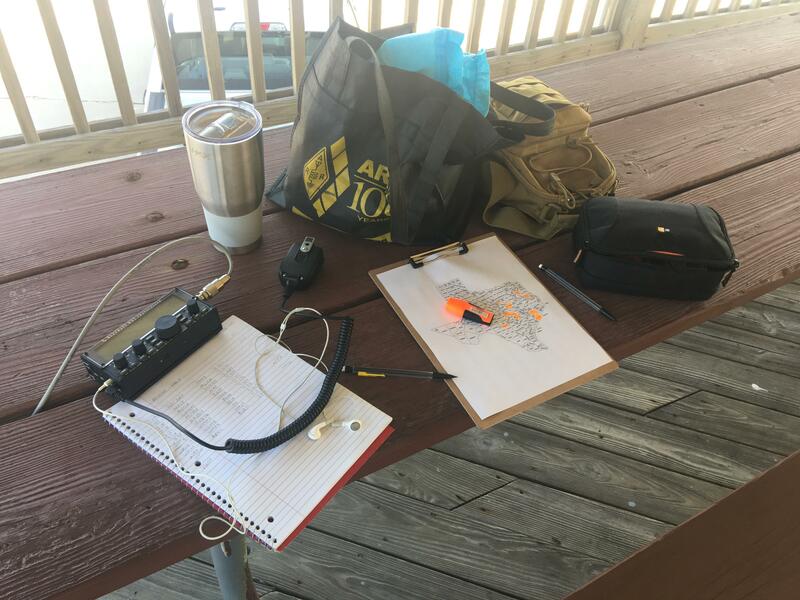 On this page, I want to share and document my experiences flying and using a kite antenna. There's nothing too special about a kite antenna. It's a fun, novel approach to the ham's age-old question about where to hang a wire antenna. When I lived inland, I could usually find a tall tree in which to hang an antenna. After relocating to the Galvston Island, tall trees are hard to come by. While the beach may lack trees, it usually does not lack wind. 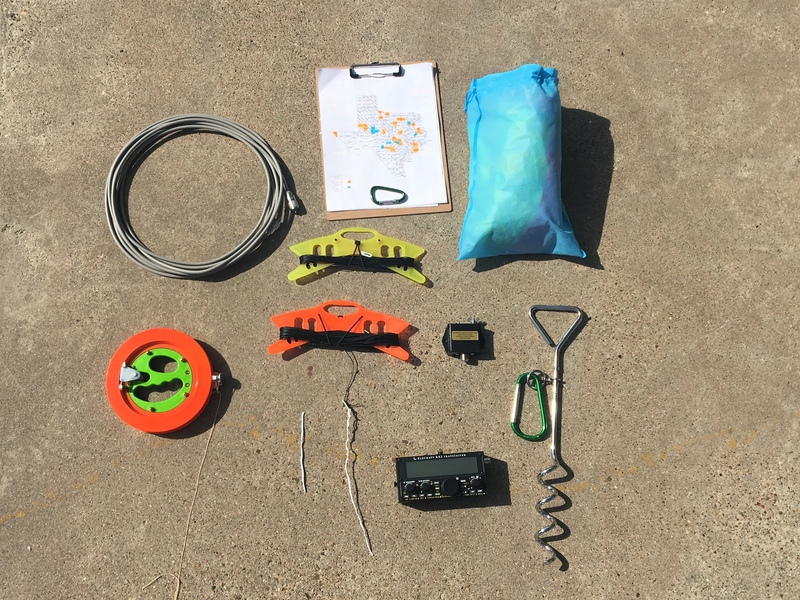 A kite antenna setup is pretty straight forward and once you deploy it a couple times, it's downright simple. The key factor is having enough wind! First of all, I want to thank SOTABeams for the very comprehensive Kite Antenna FAQ. Much of what I did was gleaned from his write-up. So if you're wanting to try this, I recommend reading his page too. - You don't have to use this, but it makes things so much easier. There are smaller and larger capacity reels, so choose based on your needs/size kite. - Any EFHW will work. They're not overly complicated to homebrew either! - Larger diameter is fine, just know the larger the diameter, the more weight thus the larger the kite is needed. The same holds true the longer the antenna wire gets - It's all a balancing act! One consideration regarding the type of kite you fly is the angle/elevation at which the kite flies. In my experience, parafoil kites fly at 45° or lower elevation. Box kites and delta kites fly at higher elevations. I do not personally own a sled kite, but I've read they fly at a higher elevation than parafoils. My parafoil flies at ~45° which means the kite string must be longer and the anchor point must be further upwind of my location if I desire for my antenna wire to be vertical. In the pics shown here, you can see I run my antenna wire somewhat along the kite string so my antenna is at an angle, neither vertical or horizontal. With a kite that flies at a higher elevation, it would be possible to have the antenna go more vertical rather than sloped. Someone with antenna modeling experience might be able to tell us which is "better". 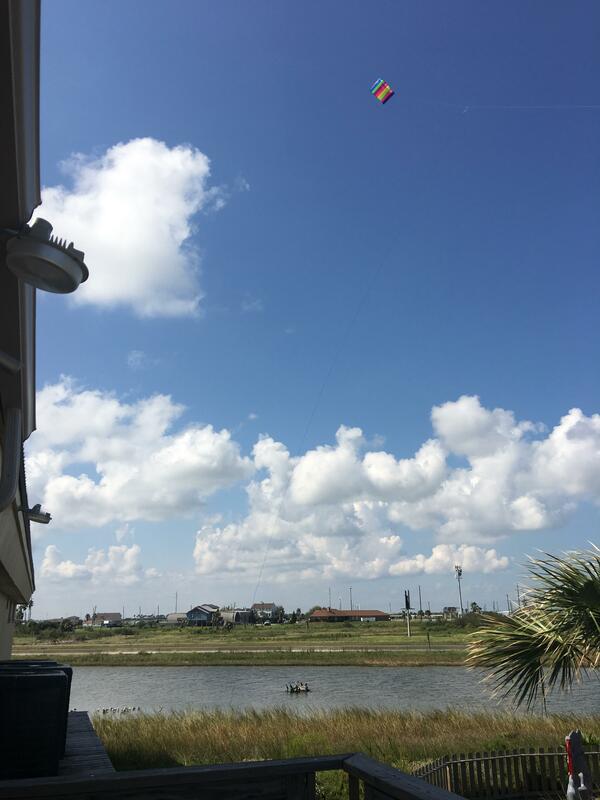 The first thing I do when setting up my kite antenna is look for any powerlines or places where the kite may get snagged when/if it comes down. 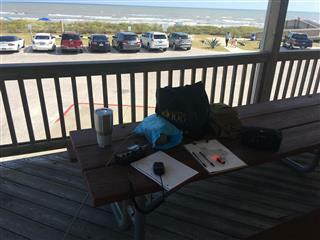 I liked how SOTABeams says, "Ensure that your kite system will fail safely." After I find a suitable location, or even prior to going out, I check the weather forecast to a) know if rain/lightning is in the forcast and b) ensure I have enough wind throughout my operating time. Also, which direction will the wind be coming from? Once I know the direction the wind is and will continue to be coming from I begin to look for a patch of solid ground to set my anchor. I use a spiral/corkscrew style anchor used for temporarily attaching a dog's tether. I picked mine up from the Dollar Tree for $1. Attached to the dog anchor is a large carabiner I also bought from the Dollar Tree. Originally I had a small, "normal sized" carabiner, but it was too small to use with my kite reel. 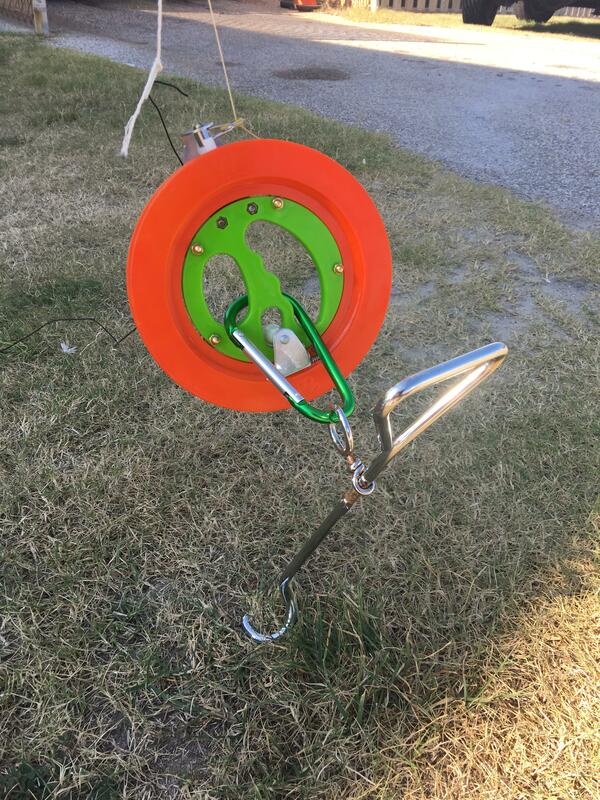 Next, I pay out about 20-30' of kite string from my kite reel (bought off Amazon), lock the reel in position, and attach the reel to the stake with the large carabiner. Now is a good time to attach a hefty swivel if your kite reel didn't come with one or you think it is too wimpy for the amount of wind you have. I walk out the kite string, unfold and attach the parafoil kite, and attach it to the swivel/clasp on the kite string. 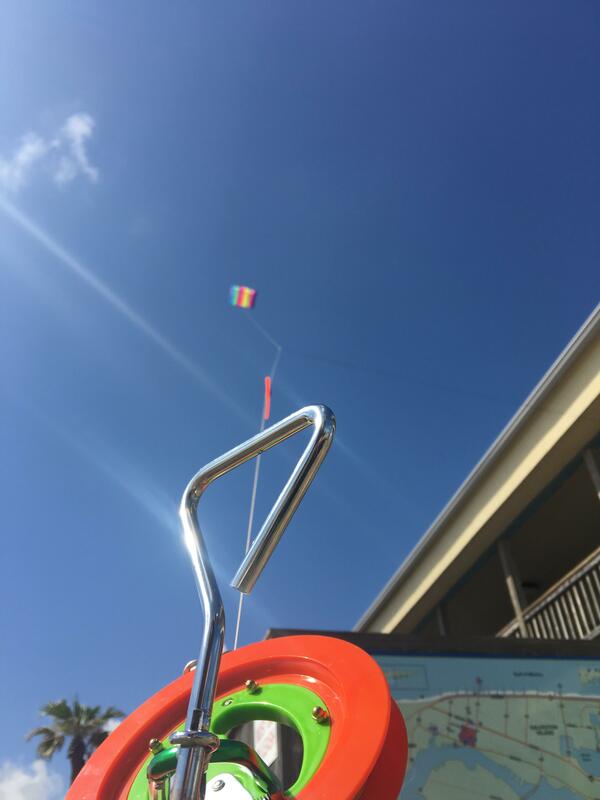 With the kite string anchored and taut, getting the kite airborne shouldn't involve more than letting the wind fill up the kite body and releasing it. If the kite doesn't take off on it's own, get the kite flying. If the kite won't remain flying without human intervention, you can stop here. To proceed will just result in a bad time and a lot of wasted effort. With the kite aloft, I then attach the end of my EFHW antenna wire to the kite string (whether it's 160, 80, 40, 30 or 20...). I 3D printed some small wire holders based on tent guy line tensioners (though any small tensioner will do). I run the antenna through two holes and, so far, I've used a twist tie to connect that to the antenna line. I've also experimented with attaching the wire to the point where the kite attaches to the line, but I like the kite to be a little higher than that (save for 160m!). With the antenna attached, I lay out the antenna wire in a long, winding zig-zag pattern so it will not tangle up as the kite lifts it. On the free end of the antenna wire, I make my connection to the EFHW match box and attach my coax feedline. After all the connections are in place, I take the kite reel off the large carabiner, unlock it and begin to slowly let the string out. The kite climbs higher and higher taking the antenna wire with it. I've noticed the higher the kite goes, the less turbulence the kite will encounter. This doesn't always mean the kite will not bounce around or get buffeted by variable gusts, but it should not sway left and right too terribly much. If you want the antenna line to run vertically, straight down from it's connection point, you can pay out line until your antenna is fully supported. If you want the antenna line to run along the kite string, you will need to attach it to the kite string using a twist tie (I'd recommend a twist tie instead of trying to use twine because it will come off easier - I usually wrap about 3-4 turns over a 2-3 in length of line.) Continue attaching the string until the antenna is at the desired height and/or your antenna is fully supported. Basic geometry should tell you if you run the kite string along the kite string, the kite will not need to fly as high. Not too, too much lower, but it's a little less kite string to have to reel in. The downside, of course, is that your radiation pattern starts at a ~45° funky angle. Experiment! 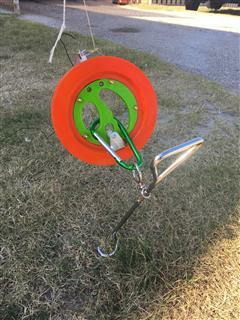 Once the kite is at altitude, I lock in the reel and attach the reel to the big carabiner on the stake. The antenna is ready for action! Lay out radials or connect any static bleeder resistors if you want. So far, I haven't bothed with any of it and have not had any issues. This isn't to say I won't ever, it's just not something I've had to contend with yet. 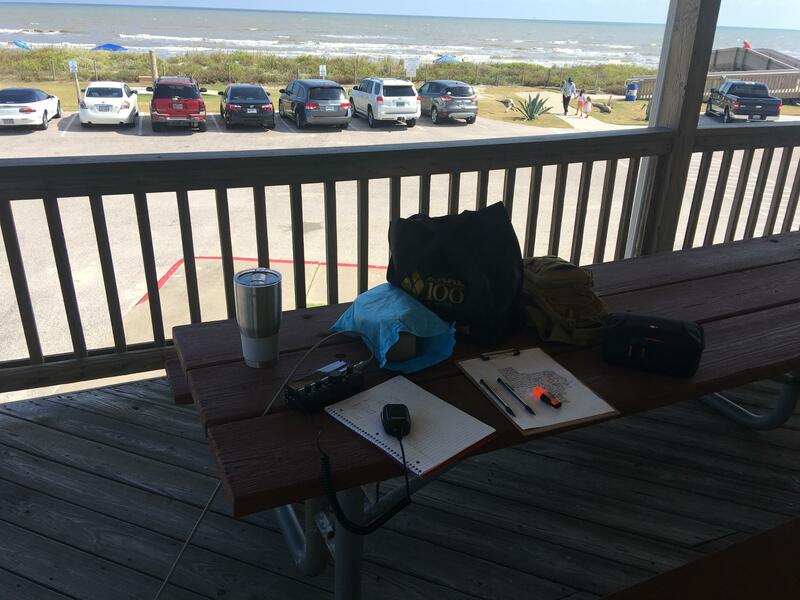 Now that the antenna is setup, now is the time to grab some shade, a cool drink and connect the feedline to the tuner. Enjoy! Here's the end-fed halfwave matchbox just off the deck. The antenna wire is visible sloping up to the kite. 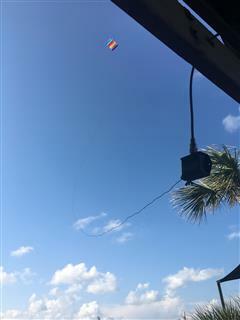 In this arrangement, I had the antenna wire hanging down away from the kite. Here's the end-fed halfwave matchbox again. 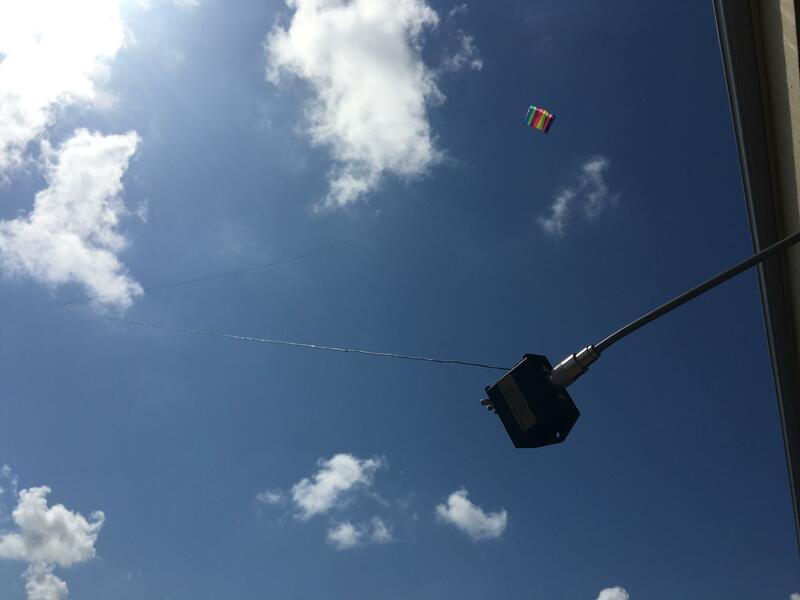 In this arrangement, I had the antenna wire climbing up along the kite string to the kite.